Our next event is February 16-18, 2017, right smack dab in the Carnival season. So, it was a no brainer when coming up with the new theme for this crop – Mardi Gras. It’s Carnival Time at Scrap Dat. We are planning on passing a good time, yeah at Scrap Dat. Our roots are in New Orleans and we know how to celebrate Mardi Gras, well the family friendly version at least. We’ll be giving out goodies that relate to Mardi Gras. The crop will be decorated with Mardi Gras colors and items. The page layout contest will have something to do with Mardi Gras. Even our food will be local cuisine at some meals. Don’t miss out on this fun filled event for all crafters. We are looking forward to planning a great time for all. Laissez les bon temps rouler! http://scrapdatproductions.com/wordpress/wp-content/uploads/2014/01/logo-in-parenthetical-frame-with-mixed-font-and-scissors-300x300.jpg 0 0 Scrap Dat http://scrapdatproductions.com/wordpress/wp-content/uploads/2014/01/logo-in-parenthetical-frame-with-mixed-font-and-scissors-300x300.jpg Scrap Dat2016-10-24 15:40:552016-10-24 15:40:55It's Carnival Time! Check out the workshops we have to offer at Crafty Chic. Not all are posted yet but you can look at what is available so far. Some dates and times still need to be determined. This year we have a massage therapist, Jill Landry. She will post her available times soon. We hope you had a great Mardi Gras and Valentine’s Day. Looking forward to seeing you all. If you have not registered, please do so ASAP. 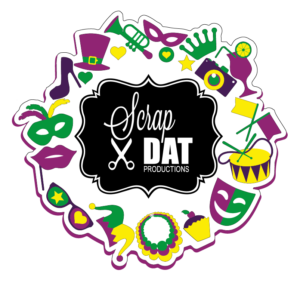 You can register online or download the 2.16 Scrap Dat Registration form, fill it out and mail it in. Many of you come with friends and family and you want to sit together. To make sure we know who you would like to sit with, we ask you tel us on your registration form or you can send in a Group Seating Form. You can download it here, fill it out and send it in. If you are coming from out of town, you need a place to stay. Check out the list of hotels we have on our website, on the Dat FAQ page. If you are able to speak with the local property, you may be able to get a decent rate if you mention Scrap Dat. We can’t guarantee the rate because they want room counts but you can try. Don’t forget to get your photos but if for some reason you need prints while at Scrap Dat, we have Walgreen’s near the Castine Center. There are other photo processing such as CVS, Walmart and Sam’s. You can bring in some food and snacks to the event. If you want concession food, the Castine Center will have hot dogs, popcorn, soda and water, as well as some other snacks available for purchase. There are many restaurants available in the area with great food. Triple Nickel for burgers, sandwiches and salads is the closest, Mi Mamacita’s for Mexican food, BOPS for frozen custard and great hamburgers, McClain’s for pizza as well many other sit down and fast food restaurants. Bring a jacket, a light, an extension cord and earphones. Check back for workshops and any last minute info. We are busy planning and working to make Crafty Chic a fun event. Tell your friends!